BIG Announcement: My Next Cookbook Cover! Home » Blog » BIG Announcement: My Next Cookbook Cover! I am so excited to share a big, fun announcement today. The cover of my next cookbook has just been finalized, and HERE it is! Woohoo! And with it hitting store shelves on October 25th, it’s already available for pre-order on some sites (hint, hint). Click the buttons below if you want to check it out in more detail! It’s so exciting to finally have a cover I can share because let me tell you what – it was no easy task getting to this point. 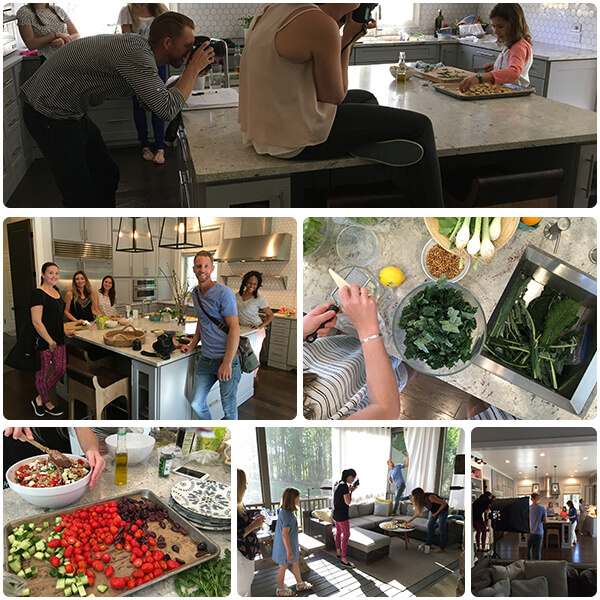 As with my first cookbook, I had planned several different photo shoots to capture all the lifestyle pictures I thought we would need. This is not something my publisher handles – it’s completely up to me to make it all happen! We had a lot to accomplish over the two different weekends I chose (when the sun did end up cooperating like I was hoping! ), and the festivities began at a beautiful local, organic farm called New Town Farms. We shop at their booth at our farmers’ market, and the owners (Sammy and Melinda) were kind enough to not only allow us to use their property, but to share their chickens, baby chicks, and baby pig with us. 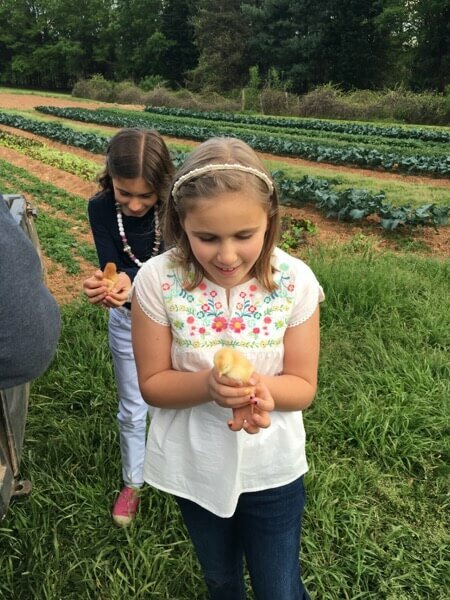 Baby farm animals, people – my children were in heaven! This was definitely the first time in my life my children actually thanked me after a photo shoot of any sort. I couldn’t believe it. Things were definitely off to a fabulous start. Here is a quick close up after they were given the baby chicks (look at those smiles!). Trust me, though, the pics that will be in the book are MUCH better than any of these that I took with my phone! The day after the farm visit we were up at the crack of dawn (on a Saturday!) to get ready for more family pictures at our farmers’ market. It was chilly and early, but we thankfully got some good stuff. Then we had a few days in-between to “rest” (or more accurately to live our normal busy lives of work/school/activities) before the real deal lifestyle pictures began the following weekend. This was when we had the whole crew there to help because I had a couple dozen recipes I wanted us to interact with in the photos. So, for the first time ever, I enlisted the help of a food stylist to completely take charge of that piece by purchasing the ingredients, making the recipes, AND cleaning it all up, instead of doing it myself while simultaneously trying to actually be in the photographs. Best. decision. ever! But wait, here’s the best part. Even with all of that help, this is how we felt after four solid days of being in photographs…absolutely exhausted! We were feeling so happy about a job well done but were not able to move from these spots for hours, LOL. Congratulations! Not just for having done another cookbook but for having done one on this topic. I learned to cook like you when I was in Peace Corps in Kenya and had access to basic ingredients only–nothing processed. But not everybody gets that experience. Anyway, the focus on real food is why I follow you. I am so excited to get the new book! I ended up buying a total of 6 of the first book and gave 5 of them as gifts. Thank you to you and your family for working so hard to make my friends and family healthier! Looks Great! I really can’t wait to get my hands on it! I am excited to see your new cookbook. I saw your other one at our local library and wrote down a lot of your recipes. I keep going back to check it out again in case I missed something. I will definitely be putting your new one on my Christmas list this year. I am opening a small home daycare and use lot of your recipes for my family and can’t wait to use them for snacks and lunches for the little kiddos too. Thank you ! So excited for your new cookbook (just pre-ordered it!) I don’t have kids yet, but I love all your recipes and tricks! I’ve been following you since 2013 and I really love that you include all food groups! Bravo! Love that! Plus thanks for giving it at gifts. :) And honestly, most of the recipes in this next book are easy enough for kids to make on their own (depending on how old they are). Can’t wait for it to hit shelves! Can’t wait to see it! Sounds awesome. I’m so excited for you! I love your first cookbook, and I’m so looking forward to your second! Wow I had no idea of all the hard work and the amount of people that went in to making a cookbook…… congratulations! I love your first cookbook and it is amazing how much your girls have grown up since then. Cant wait for this new cookbook, with as yet unseen recipes, and shall be preordering it for sure. Thank you for keeping my family eating healthily with all your recipe ideas. Congratulations!! I just pre-ordered my copy from Amazon! Yay! I can’t wait for your new cookbook to come out. I’m so excited! Thank you for all the work you have done that helps my family eat better and actually enjoy it too boot! Mealtime is far less of a hassle now, since I discovered your first cookbook. Rest now, you certainly deserve the break. How exciting! Looks like all the hard work was well worth it! Can’t wait till November! I’m sure the results of all your hard work will be very satisfying, and you’ll be so glad you held out for a cover you’re happy with! As a learning blogger, I am beginning to appreciate how much time goes into a good photo. I’m so excited for cookbook #2 (perfect timing for holiday giving!)! I still use your first cookbook every week so cannot wait to have another one to put into my weekly rotation! Congratulations Lisa and team on your second book. I know it will be just as successful as your first book. The best news about this is the theme of “fast meals”. 90% of the meals I make need to be eaten between activities, with little time for me to spend on prep. This is right up my alley. Thanks so much…I can’t wait to get it! It’s exactly what everyone asked for …can’t wait for it to hit shelves! Thanks to all of your family for the effort you spend on educating us and making it easier for us to be healthy. Looking forward to the new book! I am so excited for your new cookbook! Your first is my favorite cookbook and I own too many to count! I love how everything is super easy and approachable, with 2 small kids of my own I turn to your lunch ideas to change things up about every week! Thanks for all you do, can’t wait to see all the goodness in the next book! Woohoo! Congratulations. I’ve made pretty much every recipe from the first book, so looking forward to new recipes! Congratulations! I love your first cookbook and look forward to seeing this one. I am baking granola as I type this – something my family wants me to make every week. (I simply double the recipe and only make it every other week :-) I appreciate your hard work as it surely benefits my family. OMG Lisa I sooooo can’t wait to go through it!!! I’ve pre ordered mine on Amazon:). I’ve been following your blog for about three years now, love your cookbook and use it often!!! You changed our lives and am so grateful I came across your blog three years ago!!!! Thanks to you, your family and team for all your hard work and dedication because I’m sure it’s not easy:). Much love, cheers!!! SO excited for you!!! We’ve been following you for a long time and this feels like a win for everyone! Keep doing what you’re doing; you’re changing lives – one meal at a time. Kudos to you, your mission & your success! That is disgusting that the photographer has their shoe up on the counter! Congrats on your new cookbook!! 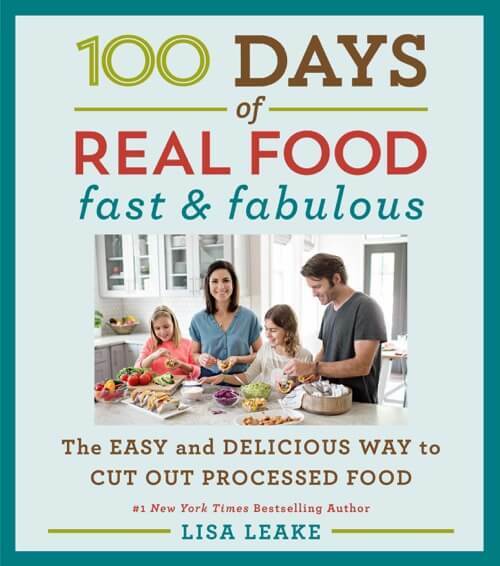 The photos look super fun, and I am headed to Amazon to pre-order now :-) Thanks for always providing timely and helpful info on real food for me and my family to enjoy! I am super excited to get your next cookbook. I love your first one and use it a lot. Thank you for sharing your recipes in your cookbooks and for all your hard work creating them. It certainly has changed my eating habits..
Just pre ordered mine! Can’t wait! Lisa, I’m so excited for you!!! And for us to get our hands on this cookbook! I’ve given away your first book on my blog and I can’t wait to host a giveaway of this one too!! EEEEEEKKKKKKKKK!!!!!!!!! Will be ordering! We use your first one ALL the time. My son and his family have their own copy too. They use theirs as often as I use mine. One of our faves is the Cheesy broccoli soup recipe! I just pre-ordered my (your) cookbook and am so excited to get my hands on it! 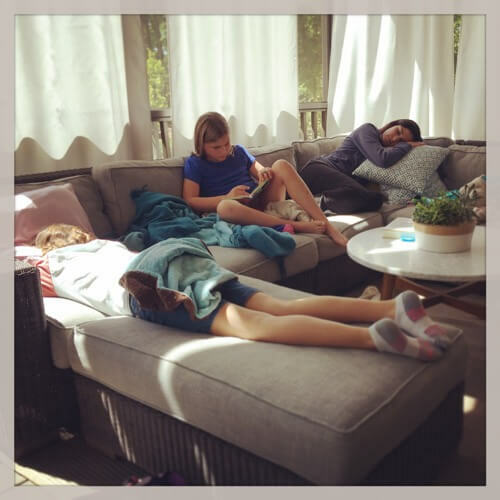 I love 100 Days – use it regularly and long to have more control in the life of my family. Congratulations on a huge job well done! Congrats and thank you for doing another cookbook. I LOVE your first one and it really helps me cook healthy meals for my 3 1/2 year old triplet girls. Barely any processed foods here! Thank you for motivating me and teaching me!! Keep up the great work! Congrats! I can’t wait to have your second book. I own a copy of the first one and I love it! Some of my favorite recipes are the corn chowder and the vegetable chilli (I love soups). I wish you continued success and thank you for sharing your passion with so many people. Congratulations…Will be ordering your books soon.I am already a great fan of your blog and loves reading all your articles. Sooo exciting, well done Lisa! Looks like another amazing and really helpful book. Love seeing our town in your book. And my Christmas list will be easy this year. Your book for everyone! Yeah!!! I can’t wait till the new book book comes out!!! I’m in England and accidentally came across your blog. As someone trying new ways of eating I was interested by your honest approach to changing your families diet. I thoroughly enjoy you’re relaxed but relative and current attitude to food. Originally a contented carnivore, I have embraced a plant based whole food eating plan. You’re adaptable recipes have inspired quite a few new dishes. Good luck with the new book. It’s what everyone’s looking for, fast, healthy, unprocessed and delicious. Keep inspiring. Adult lunches is a fantastic idea. Yes! Congrats! Thank you for all you do, will do. Your book, websites, vlogs saved my life. I have lost weight and my A1c went from 13 to 7 (YAY). God Bless you! Thank you for all your hard work and dedication. Just pre-ordered! Can’t wait. I love, love, love your first book and website. My hubby loves the meals I make with the recipes. My birthday is 11/3. Happy Birthday to me! Congratulations! I love your 1st book and am looking forward to the next. And your girls, just like all our children, are growing up so fast! Very Exciting! Congrats! I can’t wait to get my copy! I love your 1st one & use it often! I cannot wait! Love your blog and current cookbook! People are always asking me for the recipes (your recipes) and I recommend your book & blog! Very exciting! Congrats can’t wait to read it! Trying to change my bad eating habits and choices, I sometimes eat like a teenager not thinking I must be more careful to think of health not just taste am diabetic so it’s critical to pay attention and not check out and harm my health. Since discovering that I have cancer in 2008, I didn’t know anything about nutrition. A couple of years later I learned more and then found this wonderful book. I love it! I love all the natural foods. Can’t wait for the new book! Love your back-to-the-basics approach. Inspired by all your passion and hard work. Congratulations Lisa! I’m such a big fan and so excited for the new book! I’ve tried several of your recipes out for my kids so far this year and they’ve loved them. Of course the big his is the Peanut Butter Brownie Bars.